On Thursday the 20th of December, trading on the pair closed up. High volatility persisted until trading closed. In the first half of the European session, the euro rose against the dollar to 1.1486 amid the overall weakening of the US dollar. This pressure on the US dollar was exerted by expectations that the Fed would slow down the pace of rate hikes. During the US session, the dollar index began a correction. Sellers almost completely blocked the daily gains, but failed to secure them, causing the euro to fall to 1.1402, then rise to 1.1485. 10:45 France: consumer spending (Nov), GDP (Q3). 12:30 UK: current account (Q3), total business investment (Q3), GDP (Q3), public sector net borrowing (Nov). 15:00 UK: BoE quarterly bulletin (Q4). 16:30 Canada: GDP (Oct), retail sales (Oct). 18:00 US: personal income (Nov), personal spending (Nov). 18:00 Canada: BoC business outlook survey. 18:00 US: Michigan consumer sentiment (Dec). 18:00 Eurozone: consumer confidence (Dec). 21:00 US: Baker Hughes total rig count. I removed the resistance in the area around 1.1440, which the price passed several times. The LB balance line on the hourly timeframe continues to be good support for buyers. 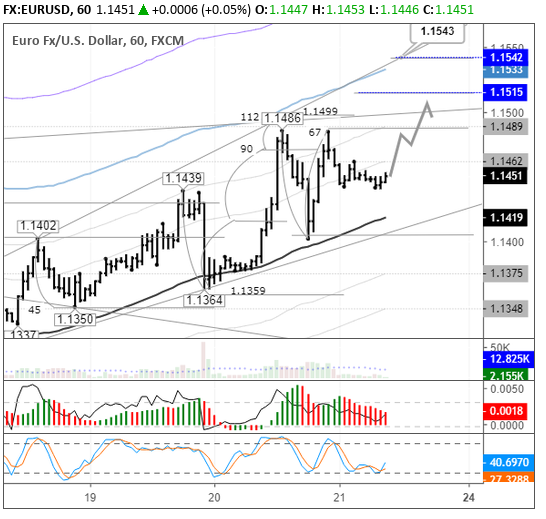 At the time of writing, the euro is trading at 1.1461. According to the forecast, I am considering a recovery to 1.1500. With the opening of the US session, we should pay close attention to US bond yields. If there is no struggle on the part of sellers around the level of 1.15, then we should prepare for a march to 1.1550. The road is open along the U3 line, and the 112th degree is passing along 1.1550 through 1.1542. If the recovery is sluggish, then we should not rule out a return to the Lb balance line - 1.1428/30. Buyers have about 5 hours to get to 1.1488.